With the hot weather still going strong, we can't help but covet more sandals, especially when we come across a style this cool. Our editors are already decked out (or coveting) simple, low-heeled mule sandals, but these have an edgy twist: mesh. The sheer fabric gives these sandals a design update that feels minimal yet sporty, while the black color allows them to go with almost any look and fit almost any personal style. Overall, they have a '90s vibe that we are so on board with. As for what to wear them with, we recommend going with a black tee, basket bag, and a pair of vintage Levi's for an everyday look. However, if you want something more work-ready, try them with a boxy shell top, simple leather backpack, and high-waisted, cropped trousers. Scroll through to check out the sleek pair we have been crushing on, plus a great budget-friendly alternative! These minimal double-banded sandals will keep your feet happy for many summer seasons to come. This budget-friendly pair is perfect for pulling off the look. 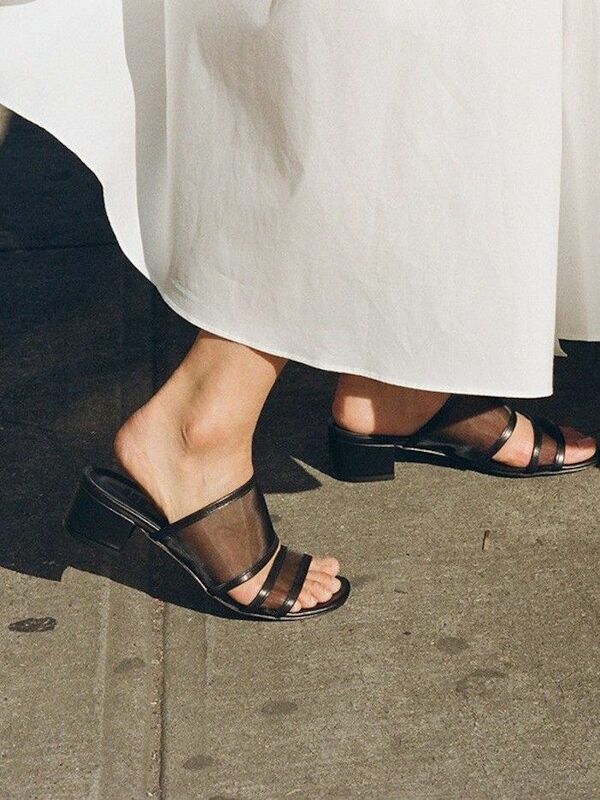 How would you style a pair of these black mesh sandals? Share in the comments below!